If you happen to have one of the Debian DVDs which where specially made for LinuxTag throw them as far away as you can! Immediately! That's no joke! I firmly believe, that they bring bad luck! It started with the DVD manufacturer telling us, that the burned DVD we send them, was broken - don't ask me, what they had for problems, we tested it, and it worked. We were under a big time pressure - luckily Martin Zobel-Helas made it just in time with a new copy of the image to the post office - about 3 Minutes before they closed for "mail to be delivered before 10 AM". Soon later they called again - this time they had problems with the cover design, somehow they had problems with the height, length and the cutting edge of the graphics we send. So they got them again, and it worked. They should have been delivered by a transportation company directly from the manufacturer to the exhibition area. But they didn't deliver in time - because he thought he shouldn't deliver that stuff to the delivery address we gave him (the exhibition area in Karlsruhe), but looked at the LinuxTag webpage, where he could see, that LinuxTags main seat is in Kaiserlautern. So instead of just delivering those damn DVDs to the address we gave him, or to get in contact with us, they decided to... not deliver at all. Instead of having the DVDs two days before the start of the exhibition, we got them one and a half day after that! Well, you might know, that this DebConfs "kick off" event is the DebianDay, having some "low level" talks for a more general audience. It would have been nice, to have some of those DVDs here in Helsinki, to give them away. Well, as said, we didn't thought about that. The second thing, that went wrong was, that the guy, who has access to the storeroom where the DVDs are, went on holiday right after LinuxTag. A well deserved one, no question. But so we run out of time, to send the DVDs to HEL. Well, we were quite desperate, so we decided to send them with FedEx or UPS or something over night. As far as I have been told, FedEx wouldn't deliver such packages over night, since they want to store them for a day in their freight house: To protect us from terrorism. Don't ask me for details. I didn't understood that; the guy phoning with FedEx didn't understood that; and I'm sure FedEx didn't understood that either. ... and you will get quite normal milk (according to my standards: 3.5% fat content, pasteurised, not ultra high heated (or whatever "ultrahocherhitzt" means in english)). 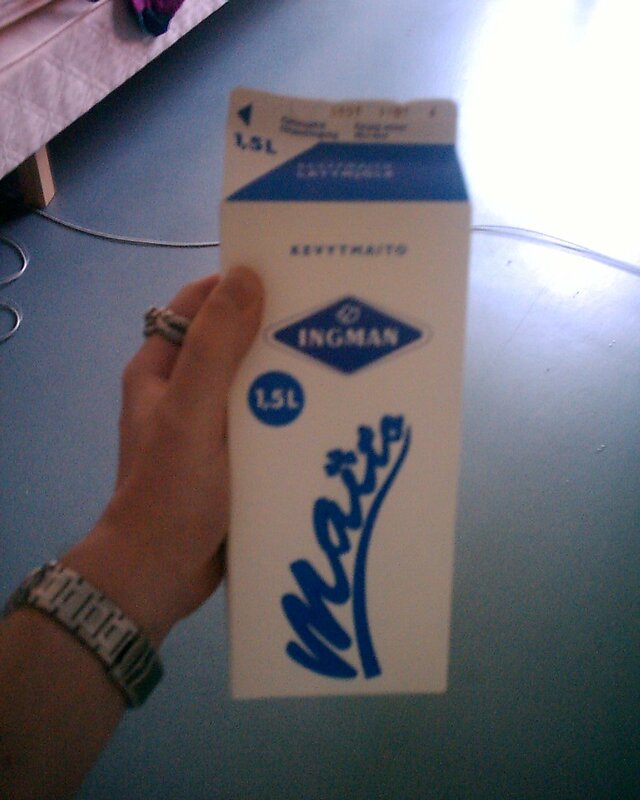 PS: Uhm... should I start to think about something, when the first picture I take in Helsinki is a picture from a milk carton? ... still nice weather - mostly sunny, occasionally a bit rain, but nothing serious. IIUC this trend will continue for a couple of more days, probably even the entire DebConf. [LinuxTag] Slides of DebianDay available! Wolfgang Borgert was so kind to collect the slides of the talks during Debian-Day. You can find them all (well, nearly all) at http://people.debian.org/~debacle/linuxtag2005debianday. Thanks for doing that, Wolfgang! Some kind of funny, since most of you didn't picked up your copy, yet (or even didn't know there would be something like that). I started an errata page on our wiki and send a note to the debconf5-event list, and now this hint: Please visit http://wiki.debian.net/?DebConf5ProceedingsErrata for some information about the proceedings. If you find something, which looks like an error, either add it to the wiki yourself, or - if you are not sure - get in contact with the author of the specific paper or me.